You can read my articles for The Hindu thREAD here. I have written a few articles for Women’s Web. You can read them here. October 2015 : Decision Awaited : Will they or Wont they? June 2015 : Choosing the right read. Featured in Top Indian Blogs. The Directory of the Top Blogs in India and Most Widely Read Bloggers under Personal Blogs. 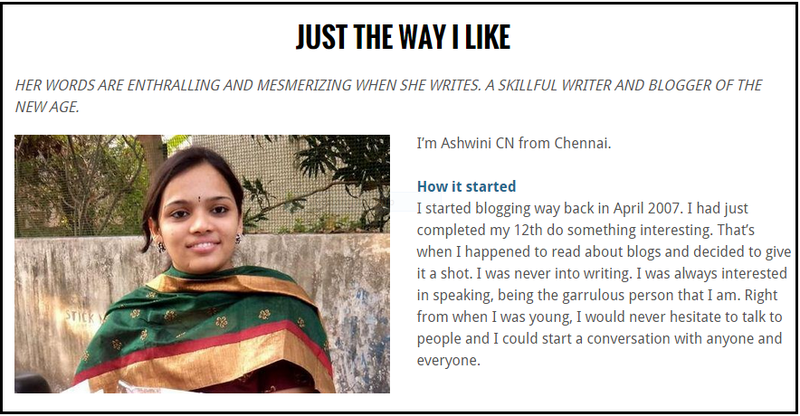 Interviewed in Artily, an online magazine. I was asked about my blogging journey. You can read the interview here. It's always great to see one's name in print and to be published. I've collated all my my published posts here. I've also mentioned the directories in which my blog has been featured. If you want me to write for you please drop me a mail.